So, you're cruising and from the side mirror you spot a yellow Ferrari. Well, nothing strange you would say, it's always pleasant to see a Prancing Horse, but as it overtakes the camera car you realize there's something unusual. It's Banana Man! 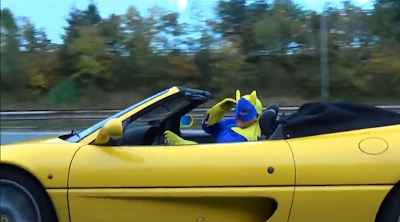 A man with the custome of the popular superhero has been spotted behind the wheel of his Ferrari F355 Spider on the british motorway.